I feel like baseball has taken over my life. 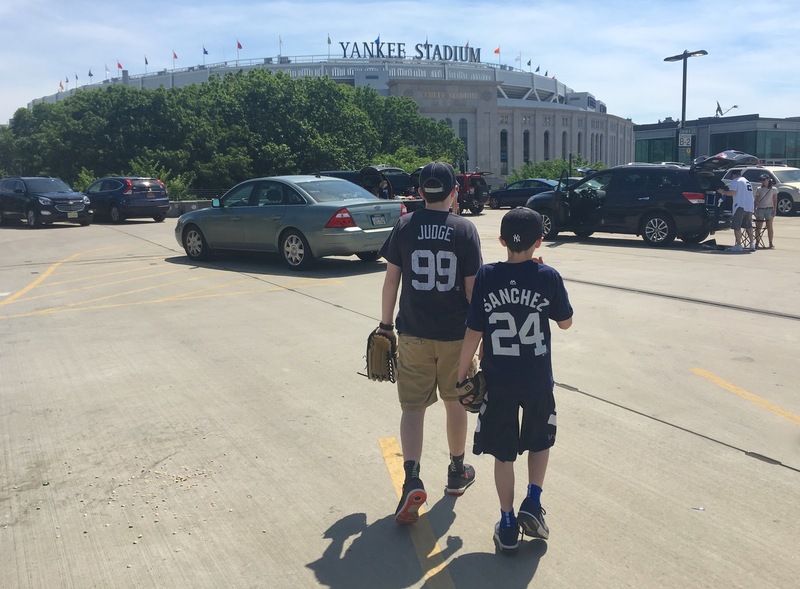 Between little league, travel ball, our local minor league team and getting to Yankees games with customers or family, it’s all baseball all the time. 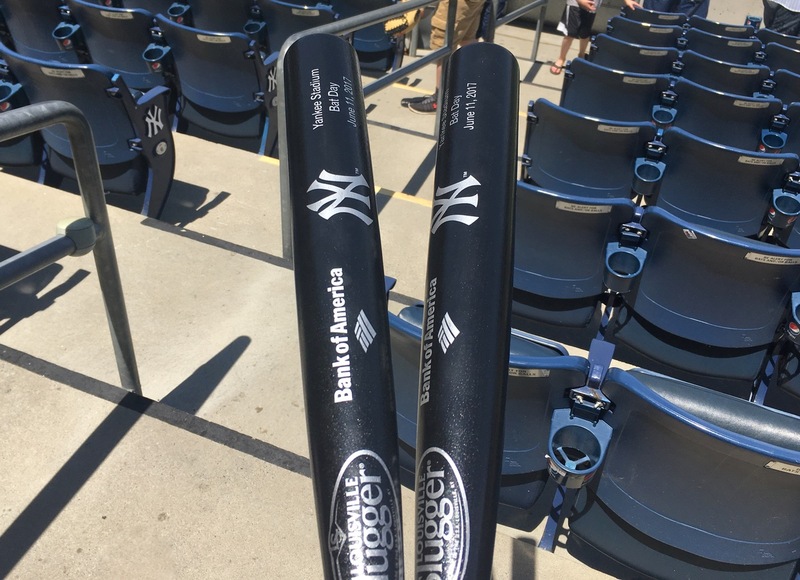 The day after finally coaching my last little league game of the season, I found myself driving into the Bronx for Bat Day at Yankee Stadium. This was my kids’ fourth bat day so I guess we can call it a tradition now. We seem to be establishing a tradition of showing up at the stadium on extremely hot days as well. For a second year in a row, we found ourselves dealing with ninety degree heat as we got out of the car. If you want to actually get a bat on bat day you have to show up early. 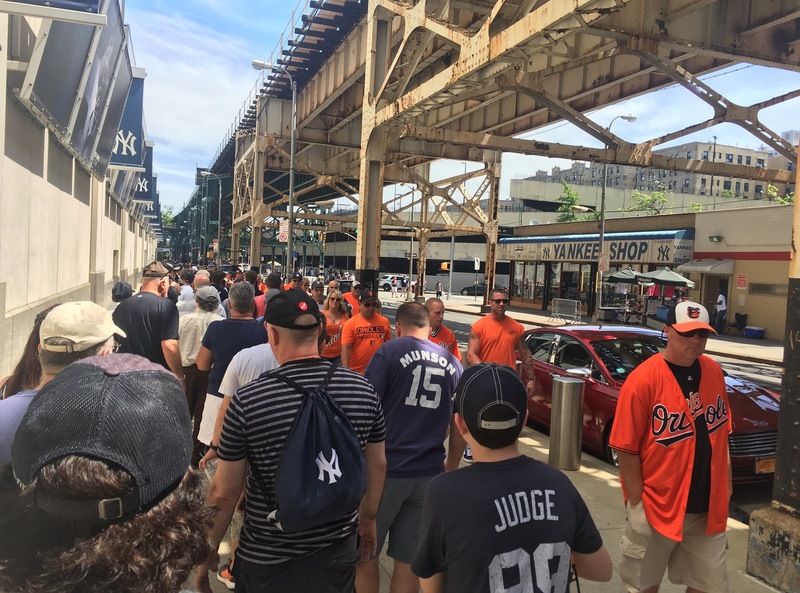 We arrived fifteen minutes before the gates were due to open — two hours before first pitch — and it was already a mob scene. We walked all the way around the stadium from the parking garage to where the line was a bit shorter and in the shade. As we stood waiting, a bunch of folks in Orioles gear came ambling by. Nobody yelled or threw anything at them. Yankees fans aren’t like that. We got through security and collected our bats. One drunk-ish dude went up to the people handing them out and said “Hey, I’m twelve. Can I have my bat?” I’ve heard this one before. The stadium employees smiled him along; apparently they’ve heard that one before too. Even that early the line for Monument Park was ridiculous, so we went down to the good seats in the outfield to watch warm ups. Missing Monument Park is no big deal. 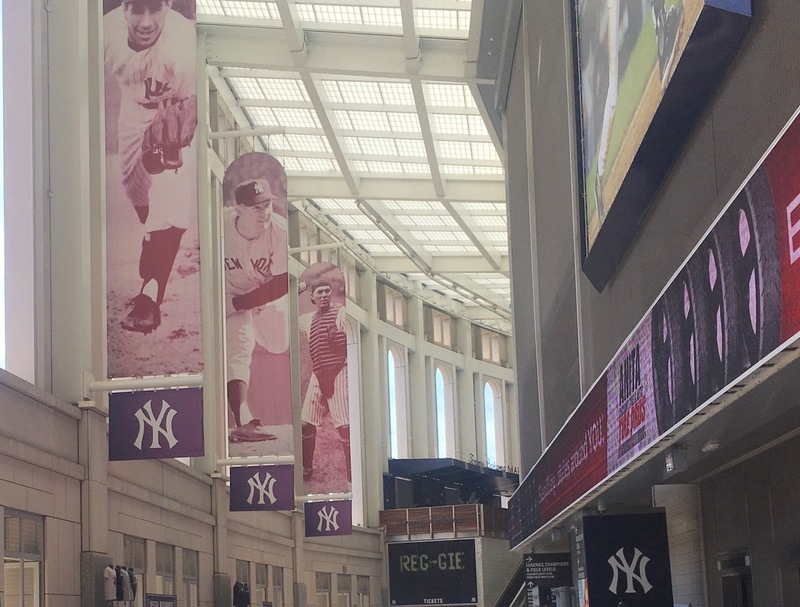 If you find yourself at Yankee stadium with time to kill before a game, the museum is just as cool and has a much shorter line. It’s also air conditioned so when it’s really hot the museum provides a little bit of a refuge. We got some food and made our way up to our seats on the second level. They were decent; I was thrilled to find that we were far enough back that we’d be in the shade, a big plus on a day like that. It was a really pleasant day. Sometimes the people that are seated around you can really ruin the experience, but we didn’t have any party poopers this time. Nearby was a young couple with two bats, one for the toddler they had with them and one for the wife’s round belly, proving the folks at the gate do have a sense of humor. It was a fun game to watch, though not much of a nail biter. The Yankees took the lead in the first inning and never gave it back, beating Baltimore 14 to 3. 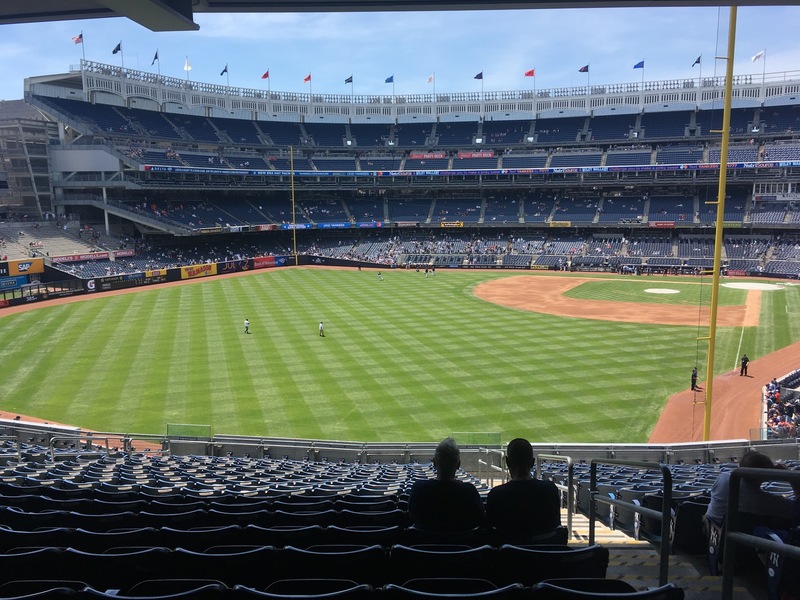 We were there for Aaron Judge’s 495 foot home run, a record for the new stadium. We were there for his first at bat in the majors last year too (also a home run) so it’s been pretty cool for my kids to watch him have such a great rookie year. As good as the hitting was it wasn’t a short game. We didn’t make it all the way to the end but we had a great time as we always do. Go Yankees! I just bought tickets to this Bat Day on May 12th. 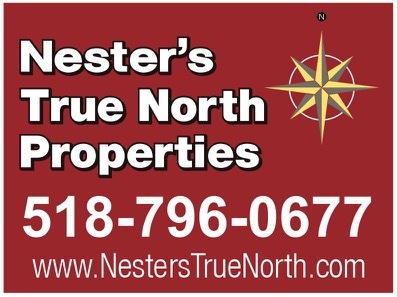 How early should I get there to guarantee a bat for my son? Is an 1 1/2 hrs sufficient? Yes. They usually open the gates 90 minutes before game time. If you’re on line when they open the gates you SHOULD be ok. Check to make sure they’re not opening early though. They do that some times.